Bottom fishing in this condition is going to be tough. The bottom is 55/60 degrees and the top is 80 so needless to say there not chewing. We are going to have to wait till that cold water moves out. The troll has finally started to pick up, BUT now you have to find the bait and that has been tough. It’s just not around. You’re going to have to sabiki it out there, find the sardine schools just offshore. Bunker are all being caught up by the netters and not making it past the Carolinas. Apparently there are huge processing plants there that all the cat food is made and Bunker are the key ingredient. So I guess it’s save the cats and not the fish. Kings started showing back up again. They are not huge but at least they are here. Find the sardine schools offshore and start there. Normally this time of year its throw the net once and go to the reef. Well, right now you gotta work for it. Cobia has been great, and not just in the obvious area, but all the wrecks have them. Jig them up using 2 oz buck tails tipped with a whole squid. If they wont eat the jig follow up with a live bait of some sort. They are not picky! We are averaging 2 to 3 fish a day just jigging the wrecks. 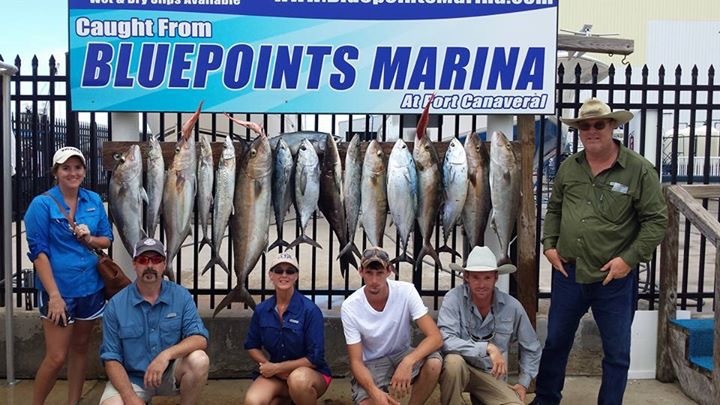 Amberjack have been hot on about every piece of structure out of the port. 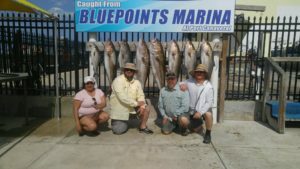 Fish them just like your fishing for cobia. And YES you can eat AJ. They are a solid white meat fish and taste fantastic. Cut the tail section with the worms out and there’s no issues. If you don’t like them, keep and call firedupcharters, we will feed the fat fireman! Lol Try AJ blackened lightly or grilled. You will love it. Great fighting and great eating amberjack.